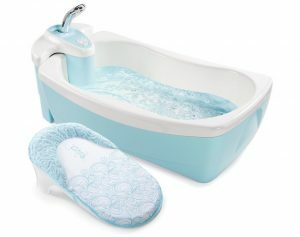 The fabric slings on the recalled infant bath tubs can detach from the tub, posing a risk of impact injury and drowning. This recall involves Lil’ Luxuries Whirlpool, Bubbling Spa & Shower with fabric slings. The infant bath tub is a battery-operated whirlpool bath with motorized jets intended for use with children from birth to 2 years. The product contains a fabric sling on a plastic frame onto which the infant is placed for bathing. The fabric sling on the recalled bath tubs does not have a white plastic attachment clip to hold the headrest area of the fabric sling to the plastic frame. Recalled bath tubs have item numbers 18840, 18850, 18863, and 18873 and were sold between October 2012 and October 2013 with date codes starting with 1210, 1211, 1212, 1301, 1302, 1303, 1304, 1305, 1306, 1307, and 1308, which stand for the two-digit year followed by the two-digit month, on the fabric sling. The U.S. Consumer Products Safety Commission issued a recall alert on October 6, 2016. REPLACE – Consumers should immediately stop using the fabric sling in the recalled product and contact Summer Infant for a replacement fabric sling with a white plastic attachment clip. Toys R Us/Babies R Us and other juvenile product specialty stores nationwide from October 2012 through October 2013 for about $60. CPSC and Summer Infant warn consumers that these tubs could have been and could continue to be sold on the secondhand market. Summer Infant toll free at 844-612-4254 from 9 a.m. to 5 p.m. ET Monday through Thursday and 9 a.m. to 3 p.m. ET on Friday, or online at www.summerinfant.com and click on “Safety Alerts & Recalls” at the bottom of the page for more information.